An edict has come down from Fox Sports Network to all of their regional networks: Thou shalt participate in social media and social networking with tools such as Facebook and Twitter. Of course they do not tell the regional networks what to Tweet about or how to go about it. They are still in the "crawl before we walk phase" of social media integration. FSN Florida/Sun Sports On-Air Talent Whit Watson will be the pioneer for that regional network tonight during the NBA playoff game between the Magic and the Sixers, using the SunSportsFOXFL twitter feed. between the Orlando Magic and the Philadelphia Seventy Sixers. Photograph courtesy of Whit Watson and his Blackberry. Social networking and social media is nothing new to Watson. "Years ago I used to write a monthly column for sunshinenetwork.com," said Watson in a phone interview today. "When I came back down here in 2005, they asked me if I wanted to do a blog. Since I love to write, I jumped on it." One of two sideline reporters for tonight's game, Watson was asked to try this by Amy Pempel, the media relations director for FSN Florida/Sun Sports. "All of our talent will be participating as we grow the use of these tools," said Pempel. "With Whit working this game and the way he has embraced social networking, it was perfect to have him be the first to do it for us. Pempel and the media relations staff of the other Fox regional networks are aware that they have to be careful how they use these tools. "We don't want to be tweeting what is coming up later on on the network," said Pempel. "They can get that from our web site. We want to offer information and insights that are different and enlightening for the fans." 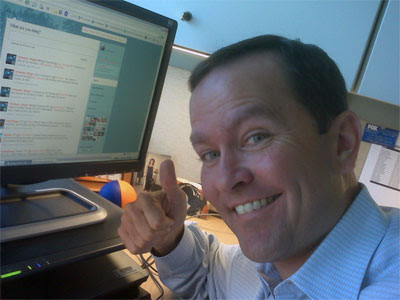 So how will Watson juggle his on-air responsibilities as he takes this first crack at Twittering for the network? "I will set up my laptop in a corner and do it there,"said Watson. "I don't want to have to battle with my Blackberry." Watson will have another challenge. He is very verbose in his blog postings. So how will he be able to keep his thoughts limited to 140 characters? "It will be a challenge," he said with a chuckle. "But it will be fun and interesting to see how it plays out." When he first posted about this on his Facebook page this morning, I replied with a comment that perhaps they should be doing a live blog instead to get more fan interactivity (so he can play social media catchup with fellow Cornell alum Neil Best). "I agree with the comment you posted on my status this morning, " Watson said. "But they have decided to do this first, and hopefully it will grow and expand as we learn how to use these tools best." It should be interesting to see how the Fox regional networks develop and mature in the way they use these tools. Perhaps the will get the recognition the Masters tweets got in Sports Business Journal this week.